The last thing you need on the scene of an emergency is an Incident Command System form that won't hold up to the weather. 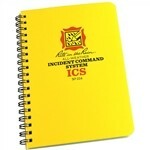 The 4 5/8 in x 6 5/8 in Rite in the Rain ICS notebook contains sets of the ICS unit log, personnel roster assignments, and the activity log. Contains 32 sheets (16 sets of a 2 sheet form).